The hedge fund industry is filled with revealing stories about how different groups came into being in unusual circumstances and then developed a niche over many years. It is a fair bet, however, that the story behind Citco Fund Services is one of the more memorable. To begin with, Citco is the acronym for Curaçao International Trust Company. It was set up by the Smeets family in Curaçao, Netherlands Antilles in 1939 to help Dutch nationals expatriate their wealth on the eve of WWII. What started as a law office evolved into a trust company. Later various tax treaties evolved between the offshore centre and the United States which eventually led to the provision of sub-fund services for offshore funds. Indeed, it was the first offshore fund launched by George Soros in 1969 that provided the genesis for a fund administration sector. Now fast forward over four decades. Soros Fund Management is still a client, the Smeets Family Foundation remains the controlling shareholder and Citco is the clear market share leader in fund administration (See Fig.1). Helping managers establish their fund vehicles outside the US helped managers from a tax planning perspective. It also gave them the opportunity to develop the ‘hedge fund model’ of using leverage and shorting securities which was prohibited under the US Securities Act. In London, Citco operates from offices in a converted Georgian townhouse in Mayfair’s Albemarle Street. William Keunen, Global Director of Fund Services, and the division’s executive management team spoke to The Hedge Fund Journal about changes in fund administration and hedge fund operations post-2008. The rebound at Citco was given impetus from around $120 billion in asset inflows over a twelve month period from big, mainly US self administered funds. The eruption of the Madoff fraud in December 2008 effectively drew down the shutters on self-administration. Thus big hedge fund operators, including DE Shaw and SAC Capital, went into the market for administration services and chose Citco. “Post-Madoff, many large self-administered funds were forced by their investors to seek independent administration,” says Keunen. “We were well-placed, well-branded and well-known as a potential candidate to perform that service.” Citco has also gained asset inflows from a gradual uptick in hedge fund start-ups and business won from other administration service providers. The net result helped the firm to replace a significant portion of assets lost during 2008-09 drawdown and to buttress its hedge administration market share lead. It has about $580 billion in assets under administration, split between $480 billion from single manager funds and $100 billion from funds of funds. In addition to administration, Citco still runs its original trust business. It also operates a niche banking service that is primarily focused on clients of both the trust and fund services divisions. The combined business employs 4,000 in over 50 locations around the world. The firm prides itself as a flat organisation, being fleet of foot and responding dynamically to changing investment needs in technology and personnel. The fund services management team is just one layer beneath the executive committee and there is day-to-day interplay between them. In May, Citco struck inked a strategic alliance with OpHedge. The deal includes a three year revenue earning arrangement and also includes Citco acquiring some of OpHedge’s intellectual property. The alliance came from looking at how to work more closely in respect of certain mutual clients. Citco felt that it would be a great add-on to its existing business to acquire the intellectual property and offer the services to its broader client base. The hook-up comes after increasingly closer collaboration between the companies in recent years. Doing the link-up showed that both firms understood how customers could benefit from a unified offering and how that could boost their joint position in the market. The attraction of OpHedge was that it had developed specific middle office services like collateral management, settlements and treasury. These built on capabilities Citco offered with reporting trade positions and cash breaks on a daily basis, desktop technology for doing real time P&L calculations as well as real time security masters and over-the-counter security set-ups. Of equal importance to the intellectual property acquired from OpHedge is the advantage for Citco in acquiring a developed team of specialist employees. This has sped up the rollout of enhanced services to clients. In fund administration, providing more data and more comprehensive reports in better formats is a key competitive differentiator. Administrators are contractually linked to the fund, but the reports that are generated circulate to both managers and investors. The overriding aim of using increased automation is to process the fund’s data and metrics effectively and accurately. The corollary objective is to provide information that both managers and investors are looking for. Managers, for example, want all the information around the net asset value process provided on an accurate and timely basis. Investors, for their part, are looking for ever improving transparency. Citco has addressed the latter with a new platform. Trends in the hedge fund market show that growth is coalescing around a couple of dozen top tier firms. What’s more the mix of investors into funds is also changing. William Keunen is the Global Director of Citco Fund Services, responsible for the fund services division of Citco. He has worked in the financial services industry for twenty three years. He has spent twenty years working for Citco in the fund administration business, including spells in Curacao, New York, the Cayman Islands and Dublin. Keunen is a qualified Chartered Accountant. Kieran Conroy has worked for Citco Fund Services since 1994. In June 2007 he moved to Toronto and took on the role of Managing Director of Citco (Canada), Inc. Prior to this he has held similar positions in both Dublin (2001-2007) and Curacao (1998-2001). He trained as a Chartered Accountant at KPMG in Dublin. Jay B. Peller is the Managing Director of Citco Fund Services (U.S.A.) Inc as well as a member of the Citco Fund Services Global Management Team. Prior to joining Citco in 2000, Peller was employed by Tudor Investment Corp. where he was Vice President of the Fund Accounting Group from 1998 to 1999 and Manager of the group from 1993 to 1997. He is a CPA. David Sage is the CFO for the Fund Administration Division of Citco and has worked in New York and currently in Dublin. Prior to joining Citco in 2000, Mr. Sage was employed by Sea-Land, a subsidiary of the CSX corporation, in 1980 as an accountant and whilst with them spent time in the UK, Netherlands and Ireland. Michael Regan is the General Counsel of the Citco Fund Services Division and has over fourteen years’ experience in the investment funds industry. 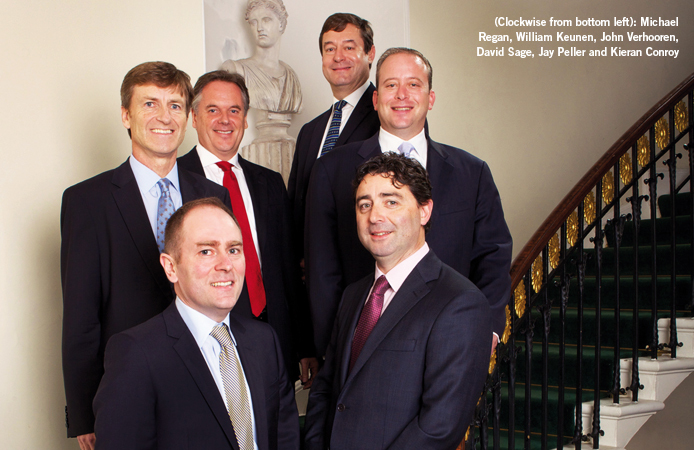 Prior to joining Citco, Mr. Regan was the General Counsel of the Alternative Fund Services division of HSBC in New York. John Verhooren is a Director of the Citco Fund Services, is responsible for its Fund of Hedge Funds group and is an acting member of the Citco Fund Services management team. He has worked in the financial services industry for 22 years, including 20 years working for Citco in fund administration.